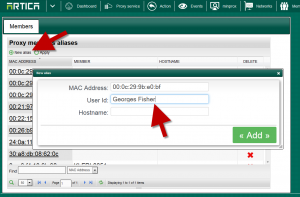 Proxy Members aliases is a feature that allows you to define alias for a specific MAC address. If your proxy service is not connected to any authentication database such as Active Directory or OpenLDAP, only IP addresses and MAC can be displayed in events. These informations are not relevant for statistics purpose. In this case, this feature is a way to transform a MAC address to a defined account. To use this feature, click on the top button on the “Members” icon. A table is displayed, click on New alias button. 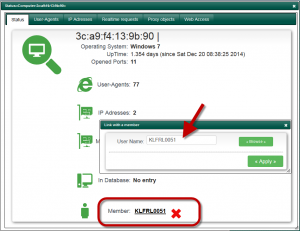 Define the MAC address and the user name and click on Add. From the real-time event, you can easily add/modify Alias. Click on the MAC address on the event table. On the layer, click on the link near “Member” label. Add the user name according to the MAC address.